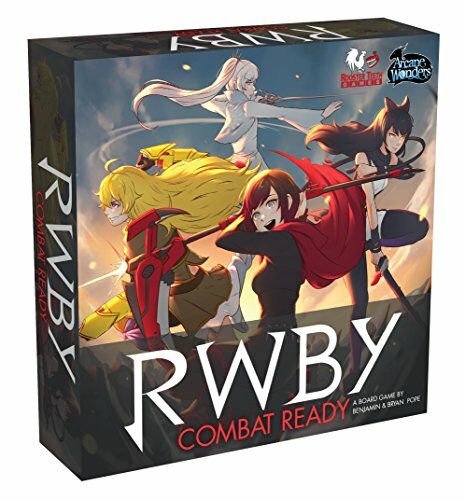 RWBY Combat Ready - Co-Op Tabletop Review — GamingWithSwag.com - Dads By Day, Gamers By Night. Introduction/Overview: Based on the popular American Anime series RWBY from Rooster Teeth the creators of Red Vs. Blue we have a co-op fighting game for 2-5 players. The game is comparable to the popular deck-building game Legendary but instead of Marvel superheroes you take the anime heroes up against a series of villains paired with some henchmen or difficult scenarios. You do not have to know the anime to play the game but you will probably enjoy the artwork and scenarios more if you are familiar with the source material. Gameplay: Each player controls a different hero from the show and you take turns facing off against the main villain. 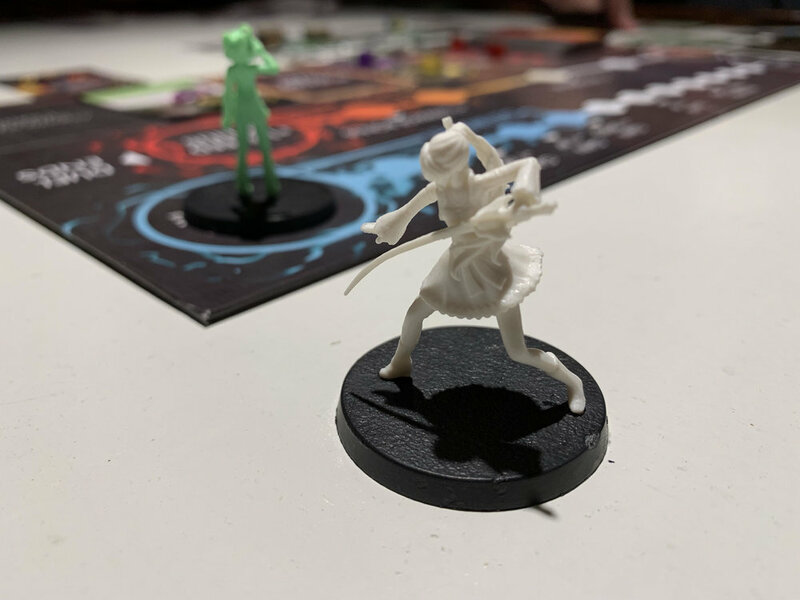 For each game you choose a villain, set their health and then choose four scenario threats to spice up the game which are typically recommended in the scenario booklet which could include henchmen, ticking time bombs, etc. The players not squared off with the main boss can choose to support the main attack or deal with threatening scenarios that pose a rising danger to the players. You have a deck of attacks you play from which is unique to each character that primarily breaks down to a speed which determines which character actually lands the hit and then a power which dictates the damage dealt if it lands. You have some high speed cards which have a high likelihood to land but can be weak so you need to be wise with how and when you use your cards to keep the villain on the ropes. The longer you engage the boss you get more bonuses and your comrades get more headway on dealing with side threats but you thin out your card options as you can only hold 6 at the beginning of a fight and pressing your luck can allow the enemy to get the upper hand. As you play through you earn experience which can be used to upgrade your deck with stronger or more interesting cards. Eventually, the boss knocks out too many players or you drop their health to zero and win the day. Rulebook: The books are broken in half with one explaining the game and another setting up the villains and scenarios. They are beautiful and full of art and examples and you can check out a pdf here and here to see for yourself. Theme: The game is steeped in the Anime featuring not only the characters but three popular villains with more villains available in expansions. Each character has unique skills and attacks that shape how they play and you can further mold that with your chosen upgraded cards. Personally, I am not deeply versed in the anime but the art is everywhere in the set, and the gameplay feels like an anime battle so the theme isn’t pasted on. Set-Up/Takedown: Once you crack open the game and sort all the cards the box has dividers inside to keep things separate to speed up subsequent plays. The game has a ton of different tokens with many being tied to specific scenarios that won’t be used every time so set up takes a little longer than its closest rival Legendary which really only has cards to sort. Components: The quality of the pieces are decent with character miniatures, translucent cubes, and a slew of tokens. The box insert is set up to sort the various cards pretty well to speed up the set/up and takedown process, although I wouldn’t have minded a few more little baggies for the many various tokens but that is easy enough to add on your own. There is no solo-play option for this game. I really liked playing the game Legendary but I think I prefer almost everything about this game more. In Legendary you don’t have a ton of control over your deck building and your deck may operate just like your partner’s while I felt I had a unique deck from the start for my character and carved it more to my liking as the game went on. The ability to scale the difficulty for your villain and scenarios makes the game quite replay-able so you can dial in a tough yet possible challenge that is rewarding to play. And I say all this as someone who hasn’t seen a single episode of the source material. The mechanics and flow of the game is worth your time and money, and due to the popularity of the show it looks like the game will be supported by expansions for those that want to play the game on repeat.